Greetings! Our below campaign is rebuilding and going strong. Welcome to all Permaculture supporters... and to all that want to support the group of us bicycling from Missoula to the top of Glacier Park this weekend, raising awareness about the interactions between humans and the enviornment. Let's make sure all our interactions are as positive as can be! Free Cycles Missoula is a non-profit community bicycle shop in Missoula, Montana. Our mission is promoting sustainable transportation by providing a variety of bicycling services that are free and open to the public. These services include the opportunity to gain a free bike in exchange for volunteering, providing an open shop area with free use of stands, tools and basic bike parts, giving access to a knowledgeable group of volunteers and staff for all sorts of projects, and offering commuter bike classes focused on safety and maintenance three times a week. We survive mostly off of donations but also have a selection of sale bikes- built by awesome staff and sold at exceedingly reasonable prices. Although our shop is actively helping people with their bikes six days a week, our community outreach doesn't stop at bike maintenance. As a main program of the Missoula Institute for Sustainable Transportation, we are active participants in creating a healthy road and trail network. 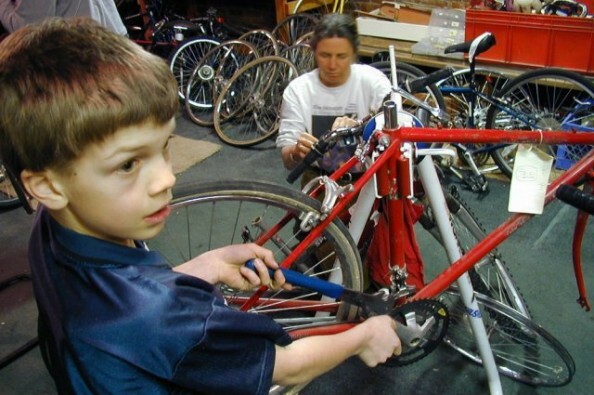 We also work extensively with local schools- giving kids bikes, teaching bike maintenance, and teaching bike safety as part of our Youth Cycles program. In the grand scheme of things Free Cycles works to be a valuable, accessible resource to the community of Missoula. Our community outreach connects all types of people, striving to create a passion and understanding for bicycles. Please lend your support! We're still rolling on this whole Gofundme action and as always need your donations! Give, Share, Like! Whoo!! First online donation received! Thank you! Thank you for helping Nate, and for all you do! Bob, you inspire us all. Thanks for being the heart and soul of Free Cycles, and for everything you do.